Dr. Ueda begins at Georgia Tech in May 2008 as Assistant Professor. Before Georgia Tech, he was a Visiting Scholar and Lecturer at MIT, where he worked on the development and control of cellular actuators inspired by biological muscle. He developed compliant, large strain piezoelectric actuators and a robust control method called stochastic broadcast feedback. From 2002-2008 he was Assistant Professor at Nara Institute of Science and Technology in Japan, where he led a research group dedicated to dynamics and control in robotics, such as robot hand manipulation, tactile sensing, and power-assisting. From 1996 to 2002 and prior to obtaining his Ph.D, he worked at the Advanced Technology R&D Center of Mitsubishi Electric Corporation in Japan. Here he was involved in a variety of activities including disk drives, machine tools, and satellite tracking antennas. His Ph.D. work at Kyoto University was on the end-point control of a robot manipulator mounted on a nonrigid base. He studied feedback control robustness in terms of the coupling of the arm and base dynamics. Robotics is an inherently interdisciplinary endeavor, requiring a deep understanding of classical subjects and broad knowledge of emerging scientific fields. Dr. Ueda's interest is in the coordinated design of robotic components, such as mechanical and electrical. This coordinated design is the key for new robotics as well as for practical mechatronics in industry. Dr. Ueda's research goal is to establish a theoretical design framework for highly integrated robotic systems. The application ranges from industrial robots, medical and rehabilitation robots, to intelligent assistive robots. Robustness against uncertainty of model and environment is crucial for these robots which work closely with humans or physically interact with humans and environments. The successful integration relies on the coordinated design of control, structure, actuators, and sensors by considering the dynamic interaction among them. Actuators are a key component for new robotics. 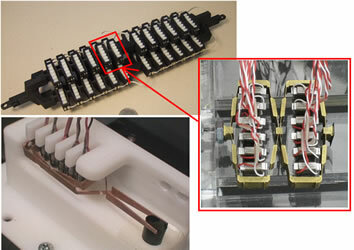 A cellular actuator concept inspired by biological muscle structure connects many small actuator units in series or in parallel, and composes in totality a single actuator. The method of stochastic broadcast control coordinates a vast number of units in this actuator system, which drastically improves wiring and addressing issues. Piezoelectric actuators using nested architecture with exponential strain amplification are developed for over twenty percent strain that is comparable to natural skeletal muscles. Dr. Ueda's research also deals with novel robotic manipulation systems and haptic devices. Robust control stability is investigated in the presence of model uncertainty, redundancy, mechanical flexibility, and nonlinearity. Dynamic interaction between robot actuators and human muscles needs to be considered for the development of intelligent prosthetics. A new concept is "pinpointed" control of muscles that enables modification of the load of selected muscles by exerting forces from robot actuators. An integrated model of a musculoskeletal human model and power assisting robot is developed and used for this control. The combination of micro structure and stochastic control exhibits many interesting aspects; even thermal fluctuation could be used as a random signal source for the stochastic recruitment law. Technical challenges include actuator-circuit integration by MEMS technology, wireless power supply for actuator units, as well as theoretical analysis of the stability and performance. Implementation of the cellular actuators to practical mechanisms is also challenging, which would range from industrial application such as micropositioner to entertainment/home application such as humanoids. In the long term, he is interested in establishing a theoretical framework that gives the abilities and limitations both at component level and system level. Jun Ueda, Thomas Secord, and Harry Asada. 2010. Large-Strain Piezoelectric Actuators Using Nested Cellular Architecture with Exponential Strain Amplification Mechanisms. IEEE/ASME Transactions on Mechatronics 15(5), 770-782. Jun Ueda, Masahiro Kondo, Tsukasa Ogasawara, 2010. The Multifingered NAIST-Hand System for Robot In-hand Manipulation,Mechanism and Machine Theory, 45 (2), 224-238 . Jun Ueda, Lael Odhner, and H. Harry Asada. 2007. 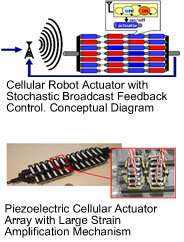 Broadcast Feedback of Stochastic Cellular Actuators Inspired by Biological Muscle Control. The International Journal of Robotics Research 26(11-12), 1251--1265.
on Robotics and Automation 20(3), 613-619.